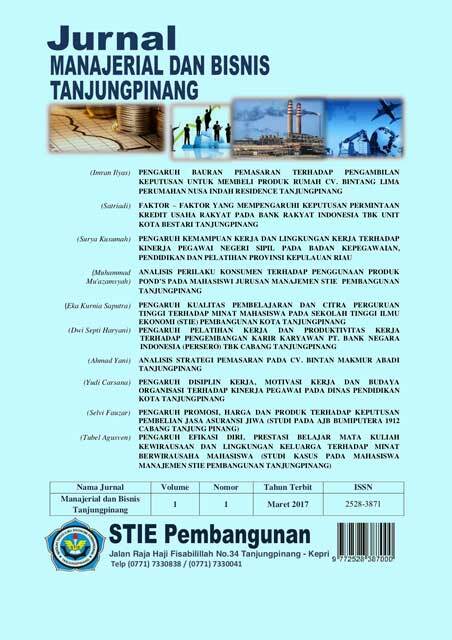 This study aims to determine the determination of competence, work environment and effectiveness of employee performance through job satisfaction of STIE Pembangunan Tanjungpinang employees. The research method used was a survey, namely the method in which respondents were employees with a total population of 122 people and 122 respondents. Data analysis techniques in quantitative research using Structural Equation Model (SEM) analysis using Amos for Windows version 20.0. From the results of this study found that the competence determines positively and significantly to job satisfaction, the work environment determines positively and significantly to job satisfaction, effectiveness determines positively and significantly to job satisfaction, competence determines positively and significantly to employee performance, work environment determines positively and significantly towards employee performance, effectiveness determines positively and significantly on employee performance, job satisfaction determines positively and significantly on employee performance, competency determines positively and significantly on employee performance, and employee performance changes are influenced by competence, work environment, effectiveness and job satisfaction of 76.2%, while changes in job satisfaction are influenced by competence, work environment and effectiveness of 60.5%.